Acute treatment with IL-1β increases the number of docked insulin granules. (A) Representative electron micrographs of mouse β cells treated with vehicle or IL-1β (10 ng/ml), as indicated (left), and quantification of the number of granules per micron of plasma membrane (right) (n = 51, 50, 56, 55, 51, 51, 57, 55, 52, 50, 57, 55 cells; 3 experiments). Experiments were performed in 2.8 mmol/l glucose, unless otherwise indicated (HG = 16.7 mmol/l glucose). Black dashed line indicates plasma membrane. Scale bar represents 500 nm. (B) Exocytosis responses of single mouse β cells treated with IL-1β (10 ng/ml) measured as an increase in cell membrane capacitance during a train of membrane depolarizations from –70 to 0 mV (left). Average capacitance response to each step-wise depolarization (middle) and total capacitance responses (right) (n = 29, 29 cells; 3 experiments). 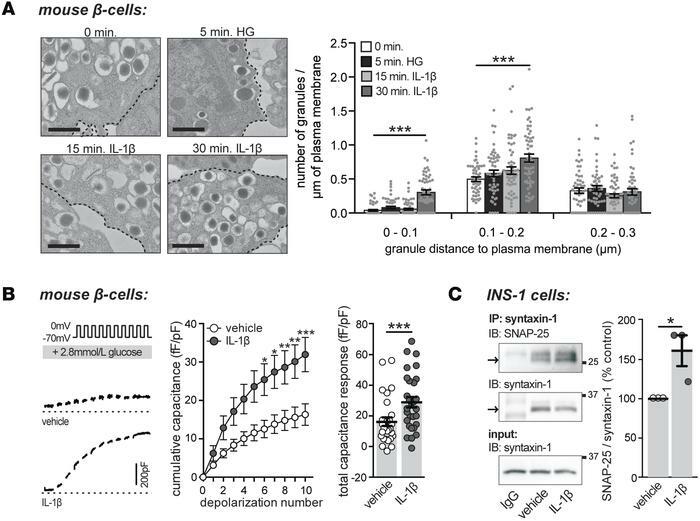 (C) Synaptosomal-associated protein 25 (SNAP-25)/syntaxin-1 complex formation in INS 832/13 cells treated with vehicle or IL-1β (10 ng/ml; 30 minutes) assessed by IP of IgG or syntaxin-1 and IB of SNAP-25 or syntaxin-1 (left). Quantification by densitometry relative to vehicle-treated control is shown (right) (n = 3, 3; 3 experiments). n values correspond to data points from left to right, respectively. Data are mean ±SEM and were compared with (A) 2-way ANOVA followed by Tukey post-test, (B) repeated-measures ANOVA followed by Sidak post-test, or (C) a 2-tailed Student’s t test. *P < 0.05, ***P < 0.001 versus vehicle-treated control. HG, high glucose.